Below you will find a list of all the Shadowbet bonuses - offered to new players. The right side offers a casino overview (click to scroll through the images). Shadow Bet Casino, having opened in 2016, is part of a number of new casinos that entered the market with much fanfare and success. 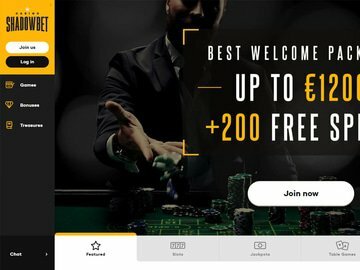 Owned by the respected MT SecureTrade Limited Casinos, it provides access to a great quantity of software developers such as Betsoft, Microgaming, and Play'n GO to name a few, all of which are offered in a friendly, easily navigated instant play casino with mobile access being compatible with all mobile devices. 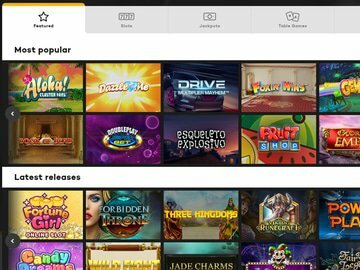 The casino interface welcomes you with a bright yellow and gray background that highlights all that is on offer at the casino. Whether you are looking to enjoy vibrant and creative slots, hit the tables, or participate playing live dealer games, Shadow Bet has it ready for you to enjoy at your leisure. Welcome you to the casino is a specialty at Shadow Bet and one they work hard at making sure your needs are met fully. That gets underway with a welcome bonus worth up to $1200 and will include 200 free spins when making your first deposit. The 100% bonus on your first deposit will award up to $300, and second and third deposits will add a 50% and 25% bonus up to $400 and $500 respectively. Then, over the course of ten days, 20 free spins will be added to your account to enjoy on the house. The free spins will be adding and are offered as a no deposit bonus on the respective ten days following your initial deposit. Bonus codes are not required in orde to claim the bonuses offered. To carry on the art of giving, Shadow Bets offers a number f weekly promotions to keep you in good spirits. Tuesday's are a special day for blackjack players as the first bet on Blackjack or Roulette will be returned 100% to you. This promo runs every Tuesday and returned bets will be credited the following day. Wednesdays are a time to celebrate and enjoy Happy Hours. This will award ten free spins for all players at the casino who have deposited within the last week. Free spins are credited each Wednesday between 5 pm and 7 pm. Shadow Treasure is a constant promotion offered by the casino and is part of their loyalty program. Simply play your fav games and watch the progress bar, Once you complete a level, you will earn a free spin on the Treasure Reel and find yourself awarded with cash, smartphones, luxurious holidays or free spins. Shadow Bet makes things simple when it comes to accessing its games, thanks to all being web-browser instant play based. Navigation within the casino is simplified using game specific categories such as features games, slots, jackpot games, table games, live casino, and other games. Powered by leading software companies, players will have access to games from Betsoft, Microgaming, Play'n GO, Nyx Interactive, NetEnt, Yggdrasil Gaming, WMS, Genii, and Red Tiger Gaming. The live casino games are brought to you courtesy of Evolution Gaming and include the typical assortment of blackjack and roulette variants. The casino can be accessed in a number of different languages, those being English, German, Finnish, Swedish and Austrian. As for accepted currencies, Canadian/U.S dollars, Euros, Norwegian and Swedish kronor and British pounds can be chosen at time of account registration. The casino has obtained licenses with both the UK Gambling Commission, the Curacao Gambling Commission and the Malta Gaming Authority. It should be noted that there are some countries that are restricted from playing at the casino. These include the United States, Spain, South Africam Hong Kong and a number others. For a full list of restricted countries, it is recommended you visit the casino directly. Showdown Bet has the right mix in place to facilitate and process deposits and withdrawals. This, of course, covers the most common methods such as credit cards, with Visa and Mastercard being offered, and a wide assortment of e-wallets are featured. Those offered include Neteller, Skrill, Trustly, Paysafe Card, and Euteller. Those who prefer direct banking alternatives will be able to process deposits using bank transfers. As for withdrawal times, the casino offers almost instant withdrawals to most e-wallets and credit card withdrawals are processed and received inside of 72 hours. While the casino does not offer payment by cheque, it will process withdrawals directly to your bank within 24 to 72 hours, which is faster than most other casinos are offering. The maximum withdrawal per transaction is $5000. Support services are available using live chat as well as email. Support is on duty 24 hours a day, and email communications are answered promptly. Shadow Bet has a lot to offer, especially for those who love genuine casino action and access to some of the best gaming suppliers online. Their policy towards near instant payments and prompt customer service show the casino has the right mindset in place to ensure it provides all its players a positive experience.